After the great lunch (and service--see Fishtales Restaurant post) to celebrate Allen’s birthday we went to The Village Store. 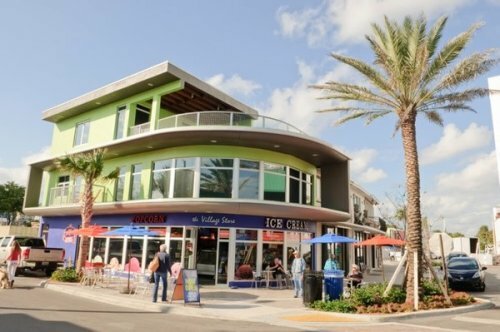 It’s in a small unlike Fort Lauderdale area called The Village right south of Sunrise Boulevard and across the street from the beach. Consisting of about 7-8 blocks in a E shape section there are bars, restaurants, a souvenir shop (with some very tacky t-shirts and such!) among other businesses but in the center of it all there is The Village Store. The Village Store consists of two sections one being the ice cream part and the other being the popcorn choices. We headed for the ice cream section. I have never counted the homemade ice cream selections but I would say there are between 12 to 16 choices and right next to it are the never ending topping choices ranging from ordinary like sprinkles to M&M’s, Gummy Bears, Yogurt chips and possibly some you never heard of before. You order the flavors you want, and toppings, getting them either in a cup or a waffle cone. We both ordered cups with me having 2 scoops. I stuck with the every day flavors of vanilla and chocolate without toppings ($6.62) and Allen had 3 flavors of which I remember coconut and orange but not the third and he had a little bit of a lot of toppings ($10.33) They basically weigh what you have ordered and charge $.63 an ounce. The hard part is passing the trays of chocolate caramel popcorn and not tasting any! We then went outside, sat down and enjoyed some of the best tasting, a little bit on the expensive side, ice cream while not only people watching, which is always fun, but also bird watching as they seemed to be all over the place waiting to scoop up anything you may drop on the pavement. The Village Store and the surrounding area is a pleasant way to spend some time when at the beach during the day, coming or going, or walking around in the evening. It shows you why you live, or visit, Fort Lauderdale. The only negative is that the trash can where you throw away your completely empty cups, napkins and plastic spoons seems to always be overflowing.